Budget Deficit- Judging by Sense or Cents? It’s normal to turn on your twitter or read a Facebook status these days encountering someone declaring (or parroting?) 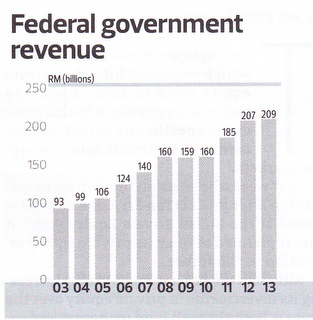 that excessive spending and the resulting budget deficit is Malaysia’’s biggest economy problem. Such declarations are usually accompanied by comparative analysis between former finance ministers’ performance in balancing country’s budget. And this declaration-as they say is apolitical. Well, whether it is apolitical or not is another question. But most importantly, whether the ‘excessive’ debt and budget deficit does make sense or not. Firstly, the budget deficit isn’t our biggest problem. Furthermore, it’s a problem that is gradually being solved. Admittedly right now we have a large budget deficit. 4.5 % or RM42 Billion to be exact. But that deficit is mainly the result of a depressed economy — and you’re actually supposed to run deficits in a depressed economy to help support overall demand. Here is the situation; the financial crisis has created a situation in which almost all of the economy’s major players are trying to spend less than their income. Since my spending is your income and your spending is my income, this means someone has to spend. Apparently right now everyone wants to save and nobody wants to invest. Yes, that includes the private sector and free-market preacher. Therefore it is the duty of the government to keep the economy robust. Since revenue is falling and everyone hates to pay more tax, government has no choice but to borrow some money. Psychologically, if the government also don’t spend, who will? Strangely, far from credited for this effort, everyone loves to make this short-run deficit an issue. It would be good if these people can give a name which country has made surplus budget in this turbulent time. Whatever, will economic recovery be enough to reduce the deficit outlook? The answer is, pretty sure. The budget deficit has fallen from 6.6% in 2009 to 5.6% in 2010. Later it was 4.8% in 2011 and 4.5% last year. How is that possible? The key is by growing the economy. With a growing economy, revenue is increasing. With that extra revenue, it can be used to servicing the debt thus, reducing the deficit. For anyone who keeps parroting our debt is worrying, please look at Europe. See the disastrous effect of harsh austerity on weak economies. See what would happen if the government choose to cut spending. See whether we like it or not when there is no money for everything just because we think budget deficit is more important than creating jobs and generates revenue. Had we choose to borrow less, save more and cut this and that, Malaysia would be in the same league with Greece, Iceland, Spain, Portugal,Italy and Cyprus.